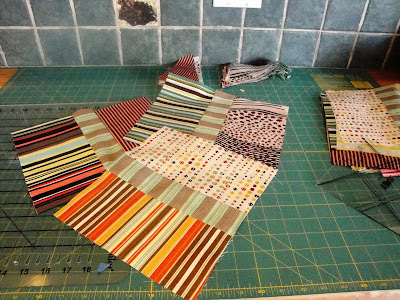 Who else is working on Lyn Brown's mystery quilt? I am making the larger size and clue one was 80 rail fences. 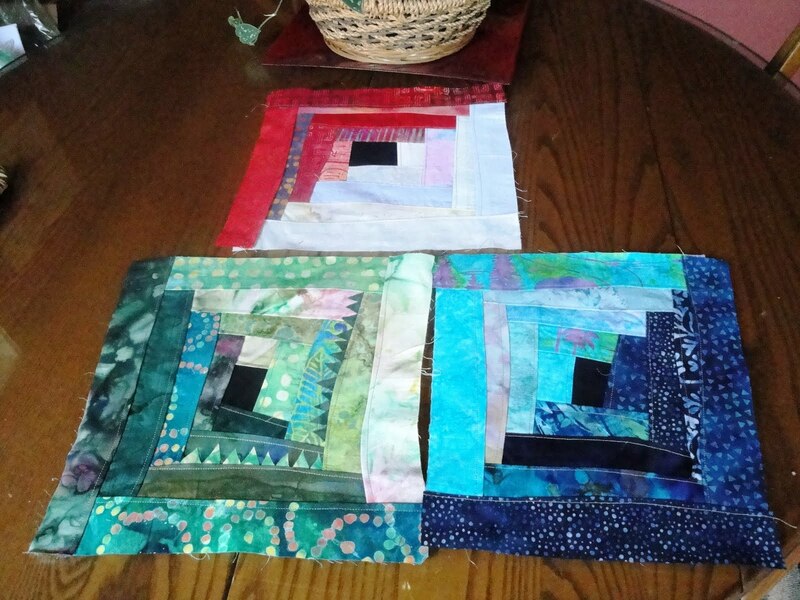 I sewed these a couple of weeks ago on a retreat. Yesterday I sewed clue two, which is 80 nine patches. Oh my gosh, I took all day to get it done. But, bring on clue three. Then I went to the mailbox and this was there. I don't know who sent it; but, someone who knows how much I love poodle anything. The only clue is that it is from Deleware. Thank you Random Act of Kindness person. It really made my day and put a big smile on my face. And, isn't it just so cute? 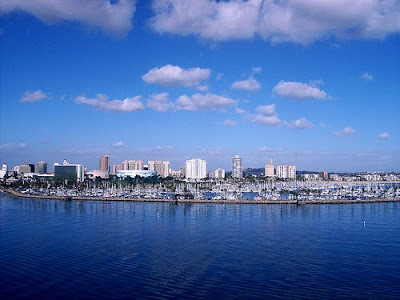 I live in Long Beach, California. This is a view of our downtown, where the Long Beach International Quilt Show has been held each July for the last three years. We quilters are so lucky and wait, albeit impatiently, for July to arrive. It is right here in our own backyard. This year it opened on my birthday. ON MY BIRTHDAY. Happy Birthday to me. I took this class with my good friend and business partner, Robin. It is called Scrappy Layered Log Cabin, taught and designed by Karen Eckmeier. It was a three-hour class on Thursday morning, opening day of the quilt show (did I mention it happened to be on my birthday). I loved making this wonky block. And, I had a great time. My BFF took me to Claire's for my birthday lunch. Take a look at that setting. 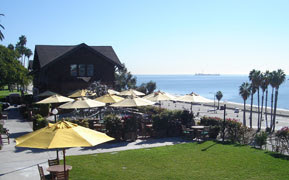 This is the restaurant attached with the Long Beach Art Museum. 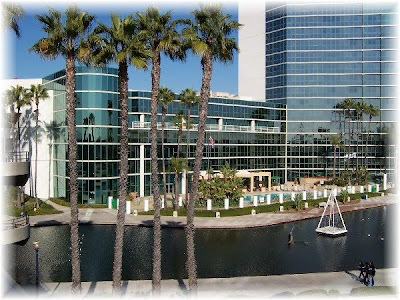 Here is a photo of the Long Beach Convention Center where the show is being held. We returned to the show at 5:00 PM to take advantage of the preview night. This is a good night to attend as it is less crowded than the rest of the show hours. 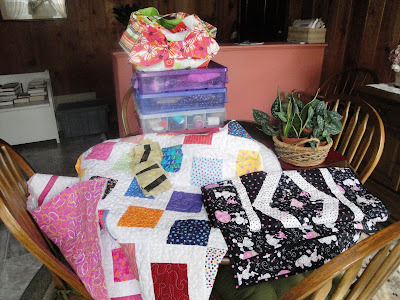 We managed to view the quilts and most of the vendors. Friday morning, Robin and I took this Shibori Ribbon Flower class, taught by Glenis Dolce. I can see these used for a number of things, purses, hair clips, headbands, not to mention lapel pins. I'll think of some more uses unless you can help me. After the class we spent more time at the show and had lunch at P. F. Changs. 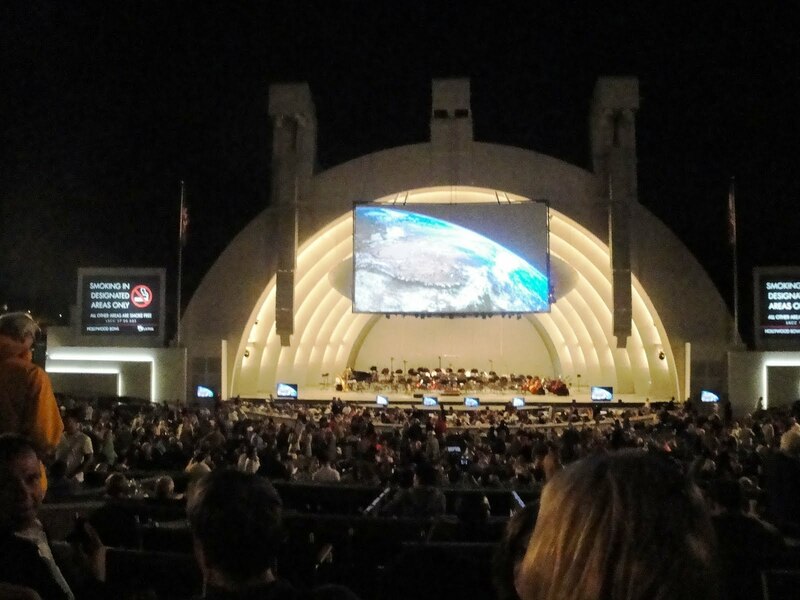 And the birthday week still wasn't over because Friday night I was relaxing under the stars at the Hollywood Bowl, listening to the Los Angeles Philharmonic along with four girlfriends. George Fenton conducted to clips from Planet Earth. It was breath taking and a perfect end to a great week. I hope your birthday week is just as wonderful as mine has been. 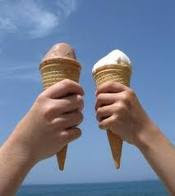 According to the National Dairy Foods Association, July is National Ice Cream Month, and the 3rd Sunday of July is National Ice Cream Day. So, get out there and be patriotic for goodness sakes. Amanda over at http://amanda-lotshappening.blogspot.com/ is having a Christmas Challenge. June was a Christmas ornament and this is the July challenge: a Christmas table runner. 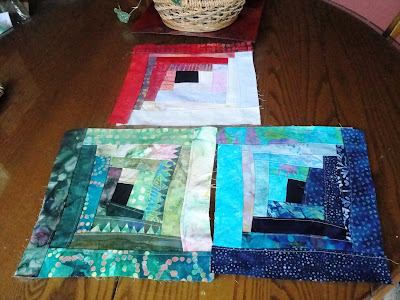 I took a class in June with Patricia Pepe http://www.patriciapepe.com/ using her wonderful tool, the X-Block. And, this is what I came up with. I can't even remember buying this fabric. But, I always buy fabric that has poodles on it. It became the perfect piece for this project. The table runner isn't due until July 31st. But, after taking a close look at my calendar for the next couple of weeks, I realize that I have a very busy schedule. So, this is it. Finished. Including poodle bling. This is my granddaughter, Rachel's, new purse. While she was here last month, she selected this pattern and fabric. I sewed it last weekend while I was on my weekend retreat. It is on the way to Pocatello, Idaho as of today. Be looking for it Rachel. I went on a weekend retreat with three girlfriends (Pam, Terri, and Pat) over the weekend. I didn't realize how much I needed the down time. It was fabulous. In fact, it was so much fun, and so productive that I only took one picture. Behind that darling Chick quilt is the maker of it, Pat. 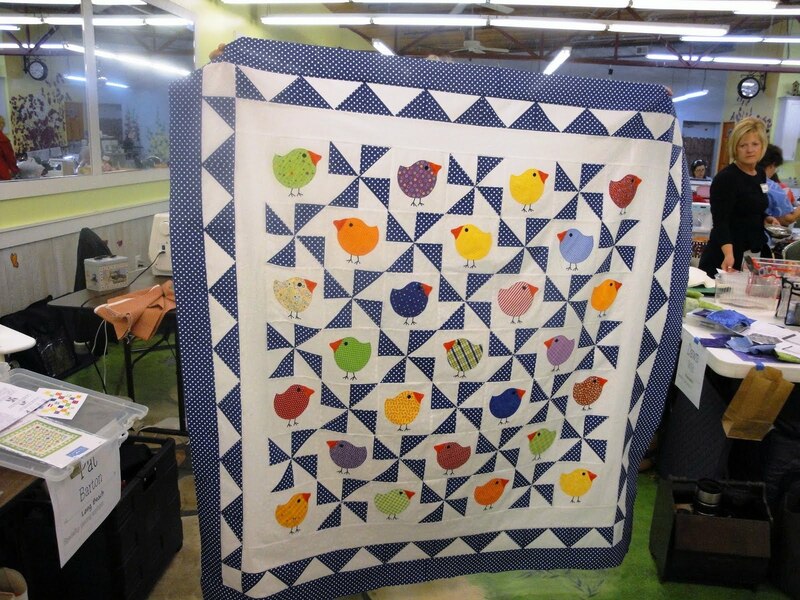 Isn't it just the cutest baby quilt? I will tell you however, that I managed to finish each project I toted along. 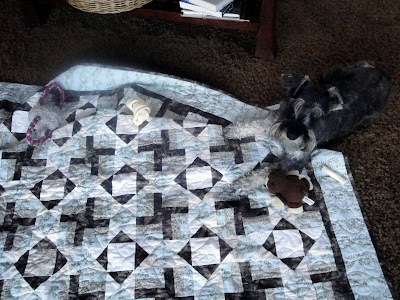 I quilted the cute charm baby quilt for little Gweneth. I finished piecing and then quilted the Christmas in July challenge table runner. 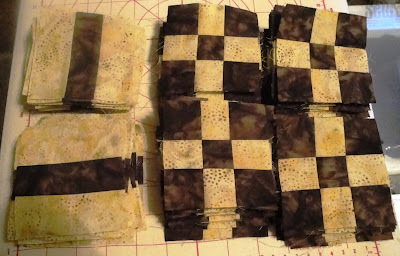 I finished "Clue One" of the Lyn Brown Summer Mystery Quilt. Oh, all right, it was only 80 rail fences. But, it's done. And then I sewed a purse for my granddaughter, Rachel. 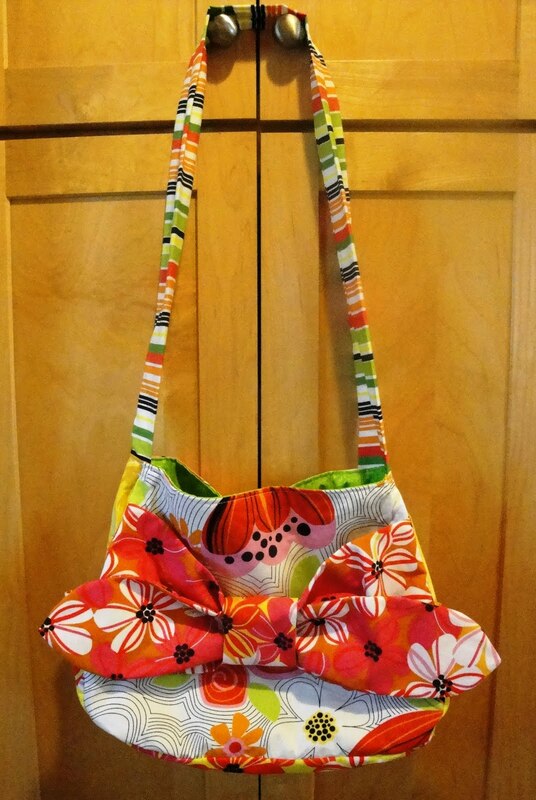 She selected the pattern and fabric on her own. 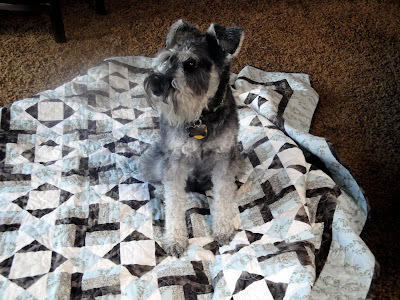 The pattern is free on Robert Kaufman's site. She loves bows. 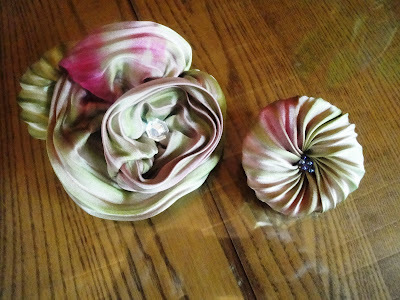 I still want to tweak the purse a bit and glitz the table runner. The fabric is Poodles Noel after all. And, poodles must be jeweled, don't you think? My dogs love sitting on my quilts. 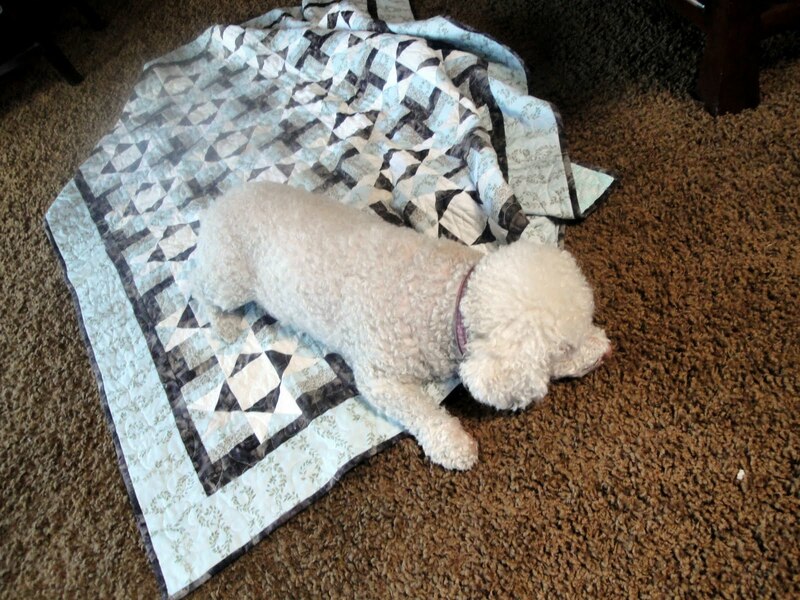 If a quilt finds its way to the floor, there you go. 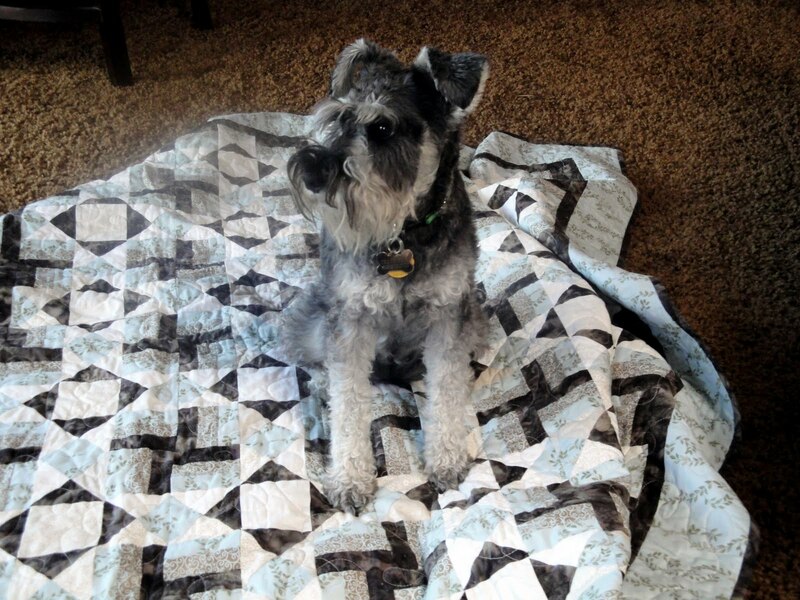 This is Trudy, my miniature schnauzer, happily claiming it as her own. Not to be out done, Gracie soon found a corner to claim. I'm telling you, they love them. I had to laugh when Trudy began to pull out her favorite goodies to add to her comfort zone. 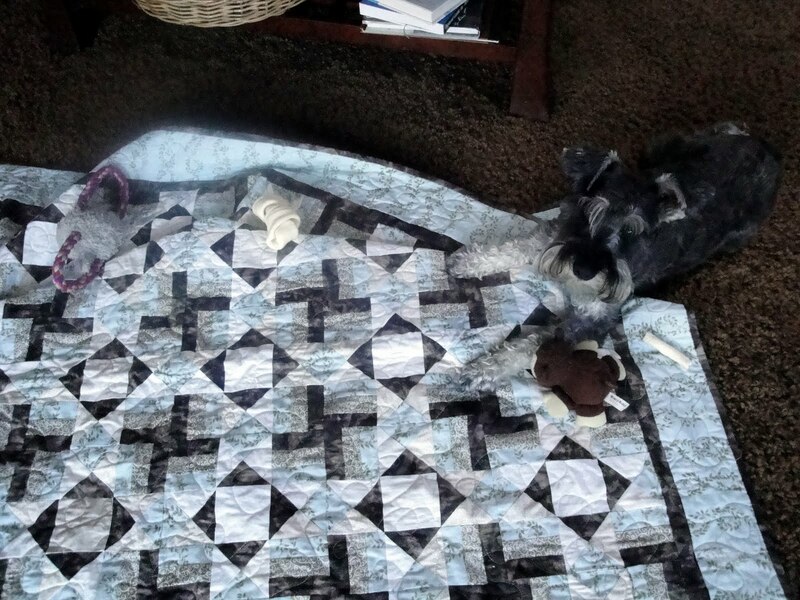 If you look carefully, you will see her monkey, her lambie pie, and a couple of her chew toys. What dogs.